For lovers of strong coffee with intense flavour there is not much that can beat a stovetop mocha maker. This simple design has been around little changed for decades. Cold water goes in the base and ground coffee in the central basket. When heated, the water is forced through the coffee at pressure, extracting the maximum flavour as it goes. The freshly made coffee then bubbles into the top half, ready for serving. 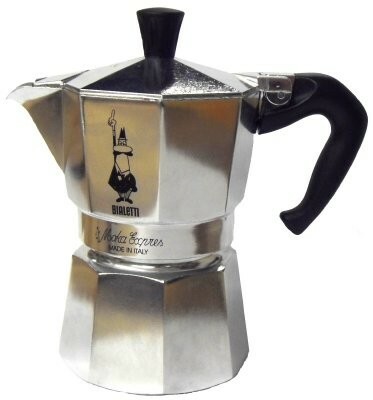 Bialetti are the household name in stovetop mocha makers, and have a reputation for the highest standards of safety, design and manufacture. All Bialetti stovetop coffee makers are fitted with a safety valve in the base. The Bialetti Moka Express comes in a range of sizes from 1 to 18 cups, they are suitable for use on all hob types except induction. To safely use the smaller sizes on some gas hobs you may need a gas reducer ring. Now £16.80 Qty: 3 In-stock.